The amount of oil smuggled into Turkey by Islamic State militants from territories under their control in Syria and Iraq is economically insignificant, US coordinator for international energy affairs Amos Hochstein claimed following Russia’s revelations. In response to Moscow accusations that Turkey is involved in oil trade with the Islamic State (IS, formerly ISIS/ISIL) terrorist group, US officials claimed that the volume of oil smuggled from IS-controlled territories is too insignificant to interest government officials. “The amount of oil being smuggled is extremely low and has decreased over time and is of no significance from a volume perspective – both volume of oil and volume of revenue,” said Hochstein, as quoted by AFP. “I don't believe that there is significant smuggling, between ISIL-controlled areas and Turkey of oil in any significance in volume,” he added. On Wednesday, the Russian Defense Ministry presented evidence showing the main oil routes leading from eastern Syria into Turkey, including photos taken from satellites, drones, and aircrafts. According to the ministry, Islamic State oil is transported to Turkey with “hundreds of oil trucks and heavy vehicles moving both to and from the Turkish border,” as ministry spokesman Lieutenant-General Sergey Rudskoy said during the presentation. So far, neither Turkey nor any other country or international organization has contested the authenticity of Russia’s areal footage showing Islamic State oil trucks heading towards the Turkish border. On the other hand, US officials have accused the Syrian government of indirectly buying oil from Islamic State in times of shortage by using middlemen smuggling oil across the Syrian frontlines, AFP reported. Additionally, the US has claimed that coalition air strikes in Syria and Iraq have done significant damage to the terrorists’ oil infrastructure, insisting that most crude oil produced on IS-controlled territories is refined in ad hoc desert pit facilities and sold on the black market within the war zones in Syria and Iraq. 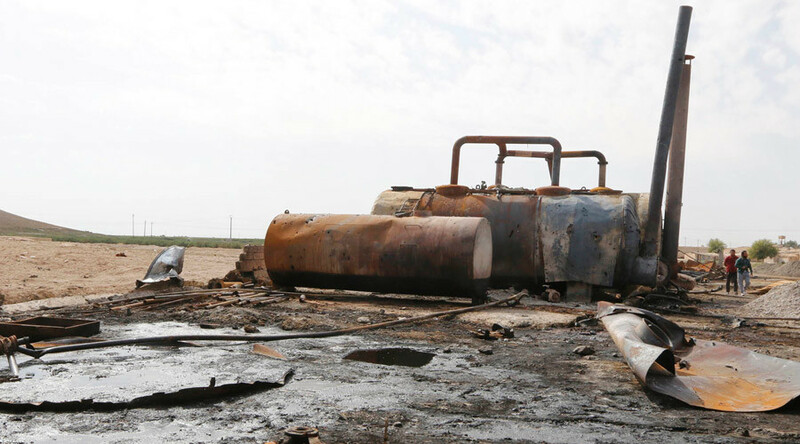 According to the US-led coalition’s estimates, Islamic State gets $1-1.5 million per day from its oil trade. However, Russia says as much as 200,000 barrels of oil per day is smuggled to Turkey by Islamic State, which equals the average daily oil export of Gabon in 2014 or Australia in 2013, according to an OPEC annual statistical bulletin. In terms of revenue, this volume could generate $8.6 million per day – eight times higher than the estimates given by the US-led coalition.